Particularly in the food industry, the Siegling Prolink 6.1 plastic modular belt series offers huge benefits compared with conventional modular belts. For belts in this series Forbo Siegling dispenses to the greatest possible extent with corners and edges in which dirt or residues can accumulate. As a result, the modular belts can be cleaned thoroughly. Hinges that open wide, a locking system without any end head, wide channels and a continuous drive bar on the underside of the belt also make cleaning much easier. The robust design with thick backs ensures series 6.1 modules are much less susceptible to breaking. The new S6.1-21 FLT modular belt is now joining the tried-and-tested Siegling Prolink 6.1 modular belt series. In contrast to the existing S 6.1-23 FLT belt, openings in the new belt are much smaller, but there are a lot more of them. Consequently, the belt is ideal for conveying and drying small products, such as fruit or nuts, e.g. cranberries or peanuts. 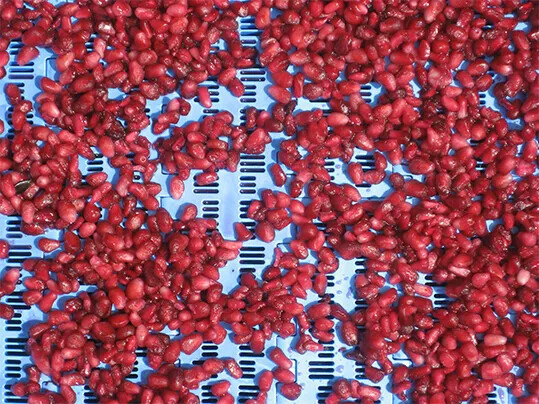 With an open area of 21% drainage is fast and involves no product loss or damage to products when washing fruit or vegetables for example.